Sometimes couples send me little snapshots of their courtship, like how they met, how long they've been together etc. and this helps me put together a romantic marriage ceremony which has particular meaning for them. Of course each couple gets a copy of their personalised marriage ceremony script to keep. Here comes the bride, from La Grange, Georgia where both bride and groom are in law enforcement. 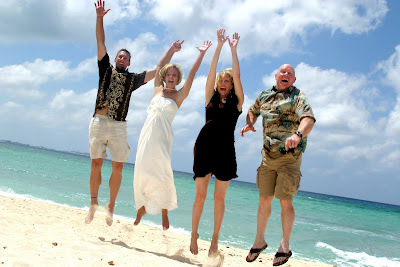 They were on a cruise accompanied by the groom's sister and her husband. They chose a Unity Sand Ceremony and brought their own vase. This was one of the prettiest Memory Vases I have seen. The foundation in chocolate brown was poured by the groom's sister. The bride chose emerald and the groom chose sapphire. I topped it off with a blessing and some white sand from world-famous Seven Mile Beach. 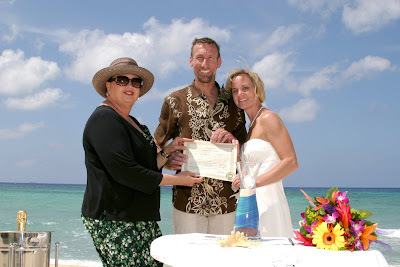 Posing with Joy and their Marriage Certificate. Playing in the sand, see their cruise ship on the horizon. This wedding took place at Blue Water Beach, so they got some good pier shots. Ceremony by Joy for Simply Weddings. 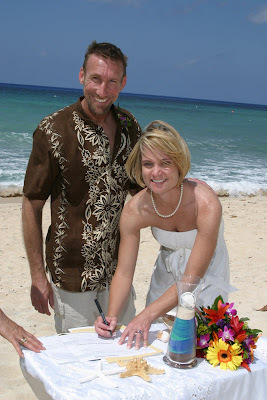 This was the all-inclusive Cruise Beach Wedding Package which can be found on my website at www.cayman-islands-weddings.ky. Flowers are "tropical" bouquet by Trisha's Roses, photography by Mari for Island Photos. 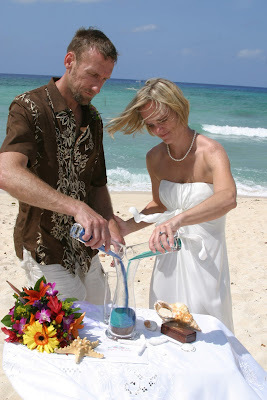 Call me to arrange your own romantic wedding ceremony on one of Grand Cayman's spectacular beaches (345) 5256551 or (345)926-9933. 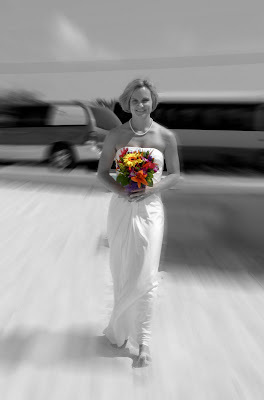 This package is perfect for "couple only" weddings as it provides witnesses and transportation to and from George Town harbour.